"Ya, it was pretty cool, hey," is how Quinton de Kock sums up his experience of leading South Africa as a stand-in captain last year. "I didn't think too long about field positions or bowling changes. It wasn't tough at all. Captaincy isn't exactly rocket science." Fans and journalists who have followed de Kock's career may not be surprised by that last remark. If anything, they are probably relieved he does not draw any similarities between cricket and the design and manufacture of spacecrafts. After all, if one elite athlete were to be hired by NASA, most pundits would have de Kock at the very bottom of their list. Whenever the Proteas media officer announces that it will be de Kock speaking with the press after a day's play, local journalists cast each other knowing glances in anticipation of some odd sound bite. "How the hell did you speak to him for two hours?" asked one respected colleague when I told him about my lengthy conversation with one of the most exciting talents in the game. Perhaps it is those slightly droopy eyes; de Kock often looks like he is one soothing lullaby away from deep sleep. Perhaps it is the lazy accent, a common way of speaking for many South African jocks. Perhaps it is the fact that he didn't finish high school, in order to devote his life to cricket. Whenever he finds himself before a camera there is predictable chatter on social media about his intelligence. "Of course I'm aware of it," de Kock says with a shrug of the shoulders. "But it doesn't bother me anymore. People can say what they like but I'm living my best life. If you're the kind of person who feels brave insulting a stranger behind a keyboard, that says more about you than it does me." There is a quote mistakenly attributed to Albert Einstein that a fish would live its entire life thinking it was stupid if it was judged purely on its ability to climb trees. Though Einstein never said it, the theory of multiple intelligences is an attractive one. Outlined in developmental psychologist Howard Gardner's 1983 book Frames of Mind: The Theory of Multiple Intelligences there are nine intelligence "modalities". Among them are visual-spatial and bodily-kinaesthetic intelligences. For the coach and mental-skills trainer Paddy Upton, who worked with de Kock in the Proteas set-up as Gary Kirsten's deputy, and as head coach of the Delhi Daredevils in the IPL, the label that has been fastened to de Kock is a damning indictment of the South African cricket-loving public. "Defining someone like Quinton de Kock as unintelligent is perhaps the most unintelligent comment that a person can make," Upton says. "It shows a complete misunderstanding of what the word means. They're using an outdated 18th-century measure of IQ as a marker of intelligence which ignores artistry, imagination or innovation; traits that Quinton has in abundance." De Kock has not read Gardner's theory. "Me and books don't get along," he admits. But the philosophy resonates with him. "I didn't need school or university to get where I am today. We joke in the dressing room that I might not have graduated from high school but I have a master's degree in cricket." De Kock's education began at King Edward VII School (KES) in northern Johannesburg, one of the finest cricketing nurseries anywhere in the world, and alma mater of Graeme Smith, Neil McKenzie and Ali Bacher. An energetic young child, de Kock couldn't concentrate for long while confined to a desk and clashed with teachers who had to drag him off the sports field. With bat in hand he decimated schoolboy attacks. In late 2009 he was given the opportunity to walk away from academics when Grant Morgan, then coach of the Highveld Strikers, the feeder team for the Lions first-class franchise, offered him a way out. "Morgs wanted me to make the step up to professional cricket and I told him if he could get me out of school I was in," de Kock says. He made his debut as a 17-year-old in Cricket South Africa's three-day competition and though he only made 9 and 6, he averaged 65 from his next four games at a strike rate of 111 and a top score of 152. It was around this time that he sat down for a conversation with his school headmaster. "It was a long discussion about my future but my decision was already made up," de Kock says. "I was offered a contract that would make any 17-year-old's eyes water. My parents were on board and we decided to pull the plug on school and invest everything I had in cricket. I have no regrets. Things have turned out all right." A bit better than all right. In the 2010-11 season, de Kock made his debut for the Lions. A year later he ended the 2012 Under-19 World Cup in Australia as the fourth highest run-scorer, cracking two fifties and a century. He returned home to help the Lions lift the Momentum One Day Cup, which ended a five-season trophy drought for the team. By December 2012, 20 years old and already being compared to Adam Gilchrist, he had pulled on his country's colours, in a T20 match against New Zealand. There were temperamental issues along the way. Playing in a four-day match in Cape Town in 2013, de Kock got into a heated exchange with Cape Cobras player Alistair Gray and, after shoving him in the chest, threatened to hit him with his bat. Though he escaped a ban, it hinted at a fire that still burns. When asked about that confrontation with David Warner in the Kingsmead tunnel last year, de Kock chooses to remain tight-lipped. "What was said between David and myself should not be heard by young kids," he says. "A lot of people ask me what was said but I've only shared that with a handful of people and that won't change. I don't regret that it happened because it was necessary to stand up to Warner, who is just a bully, but I wasn't proud of it either. It's not the person I want to be and I've worked hard to not repeat past behaviours. I've always been a feisty character and when I was young I wasn't afraid of sticking my face in tricky spots." Indeed, de Kock's reputation preceded him before he joined the Proteas in 2012. There were rumours of bust-ups with the South Africa Under-19 coach, Ray Jennings. Upton and the rest of the coaching staff knew they had to find a way of dealing with a volatile character. "When a guy is as naturally gifted as Quinton there is a risk of blow-ups when things go against them," Upton says. "He's also a naturally shy and quiet guy and so isn't necessarily going to vocalise any frustrations he may be feeling. The energy contained within him has the power to be explosive on a cricket field but it can also explode in other ways. When he arrived with the national team we knew there was potential for him to head the wrong way." On-field success kept the demons at bay. De Kock followed up an ODI century from the top of the order against Pakistan in Abu Dhabi in 2013 with three consecutive ODI hundreds against India, equalling what was then a world record. In 2014 he became part of the Test team and ended the year with his sixth ODI ton, in Sydney. But the good times weren't to last. 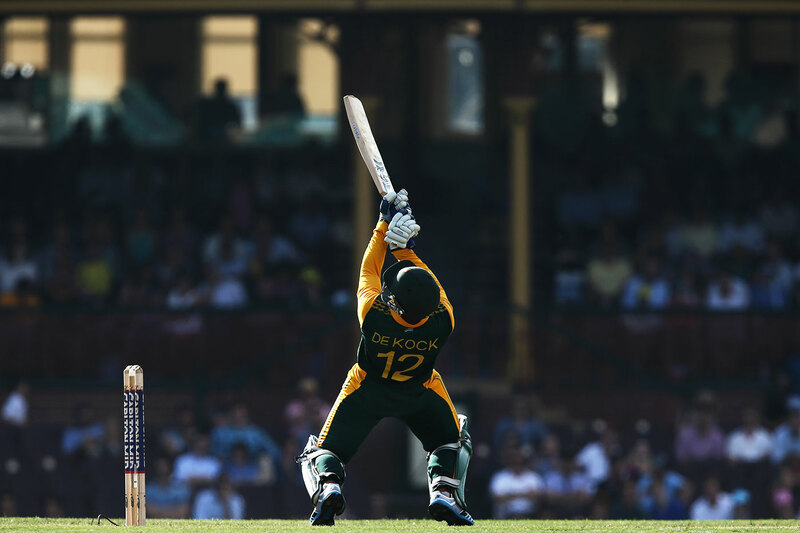 De Kock had a disappointing World Cup down under in 2015, averaging just 20 from eight matches. A few months later he was fined 75% of his match fee after pleading guilty to shoulder-barging Bangladesh's opener Tamim Iqbal. His aggressive approach and perceived weakness against the turning ball meant he was omitted from the Test series in India later that year, replaced by Dane Vilas behind the stumps. For the first time, de Kock began to question his abilities. "I was heartsore and angry," de Kock remembers. "I was really emotional. It felt like the first time you get dumped by your girlfriend. It was the first time cricket made me feel like that. I stopped training for a little bit and completely turned my back on the sport. I needed to reset the batteries." He turned to fishing and the bush - two loves that he says still give him more joy than cricket ever will. He began sketching ideas for the tattoo sleeve that now covers his right arm, honouring Africa's Big Five. He lost himself around campfires and wrestled tiger fish on the Zambezi. "Facing a Mitchell Johnson bouncer is tame by comparison," he says. "Pulling in one of those monsters is the greatest adrenaline rush you can experience." Recharged and rebooted, de Kock returned to domestic cricket with a purpose. He began refining his training and understood that natural talent alone would not carry him to the heights he was capable of reaching. "I needed to be humbled a little bit," he says. "I learned an important life lesson." The change did not go unnoticed by his Lions captain, Stephen Cook, whose family had played a role at pivotal stages in de Kock's life. As an 11-year-old, de Kock had attended a training camp with Stephen's father Jimmy, the former South Africa opener who became a respected youth coach in Johannesburg. Then it was the turn of Stephen's brother Ryan, as the first-team coach at KES, before Stephen himself came in. "We all just knew from the very beginning that he was something special," Stephen Cook recounts. "No other kid that age picks up length that quickly or has such natural timing. But the game maybe came too easy to him. The way he responded to getting dropped told me that he would one day retire as a superstar." Cook speaks about de Kock like an older brother would. "I definitely have a soft spot for him. He is a misunderstood character. People assume he's not a deep thinker but his mind is incredibly switched on in a unique way. He has an exceptional ability to read situations on the field and adjust accordingly." 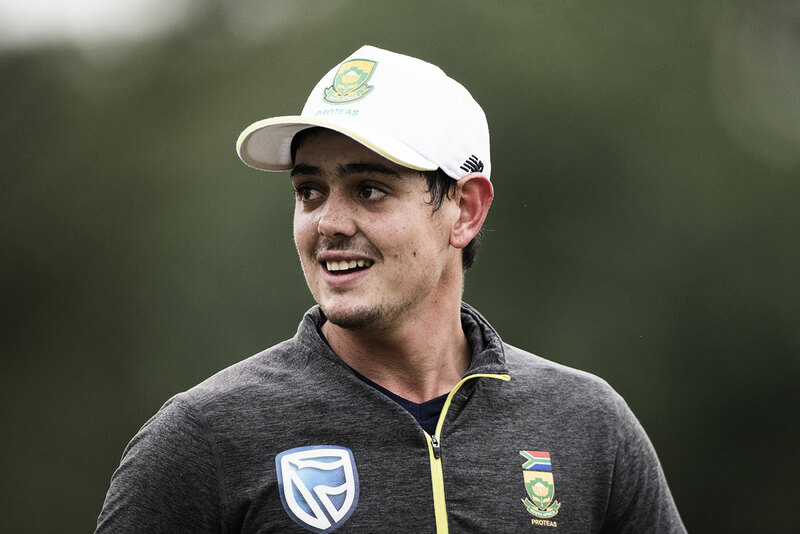 At the start of 2016, when South Africa had been dismantled by Stuart Broad at the Wanderers, and lost the Basil D'Oliveira Trophy, de Kock was recalled to the side for the dead rubber in Centurion, where Cook made his debut. Both scored centuries in a 280-run consolation win. His Centurion knock was the shot in the arm that de Kock needed. He scored two more ODI centuries against England, and then went to the IPL. During one training session, as Upton, who had taken over from Kirsten as head coach of Delhi Daredevils, was watching de Kock in the nets, his assistant Rahul Dravid wandered over to exchange a few thoughts. "Rahul said to me that what we were witnessing was the act of a genius," Upton says. "He said that we, as South Africans, did not appreciate just how good this guy was. I had goosebumps when Rahul told me this. It was an incredible moment." In Delhi's next game, against Royal Challengers Bangalore, Virat Kohli scored 79 off 48 balls and AB de Villiers 55 from 33, to put up a total of 191. De Kock put two of the greatest white-ball players of all time in his shade by smashing 108 from 51 deliveries in a successful chase. What's more, he hardly played an unorthodox stroke. "Rahul turned to me and just gave a cheeky smile," Upton says. "He was telling me that this is what he was talking about. To this day it remains one of the most poignant moments I have ever experienced and it just confirmed what an effortless genius Quinton is." Any question of de Kock's place in the national side had dissipated by the time the team toured Australia in late 2016. During a training camp, the players were gathered round a TV watching offspinner Nathan Lyon, when de Kock said to no one in particular, "Next time I play him I'm going to hit him backward of square." Cook was taken aback. "I thought, 'That's a lot easier said than done, mate'. It's not like he'd been working on that particular skill in training. He formulated this plan just from watching a few balls on a screen and didn't talk about it again. We couldn't wait to watch him play Lyon." The plan worked a treat. De Kock scored 84 and 64 in the first Test in Perth and top-scored with 104 in the second in Hobart in a series-clinching innings victory. Using cuts, inside-out drives and aggressive sweeps, he helped himself to 97 runs from 115 balls against Lyon without once being dismissed by him. "I back myself to know about the game," de Kock says. "I don't know what it is. I find it hard to explain. If I'm in the right space I can see what will happen before it does but there is no formula for how I do that. I couldn't teach anyone how to do it." There is perhaps no greater exhibition of de Kock's genius than when he waltzed his way to 178 off 113 balls against Australia in Centurion in 2016. Hammering 16 fours and 11 sixes, de Kock single-handedly made light work of the target of 295. South Africa won with 82 balls to spare. "He was just phenomenal that day," remembers JP Duminy, who has been de Kock's team-mate for all seven of his highest ODI scores. "We knew he'd do something special that day even before he walked out to bat. Every now and then he gets this look on his face that lets us know he's in the zone. It's hard to describe. It's calm but also full of energy. He had that look and when he picked up a straight ball and hit it for a huge six over square leg in the second over, we just knew." That innings was the standout performance in a standout year for de Kock and helped him secure a glut of personal accolades at the 2017 Cricket South Africa awards. He went home with five trophies, including Cricketer of the Year and Player's Player of the Year. "I'm not really interested in things like that," de Kock says. "My goal has never been to retire with a high average or be recognised on the rankings list. My goal is to be an impact player. I want to hit the ball hard and win games and tournaments for my country." Which brings us to the World Cup. 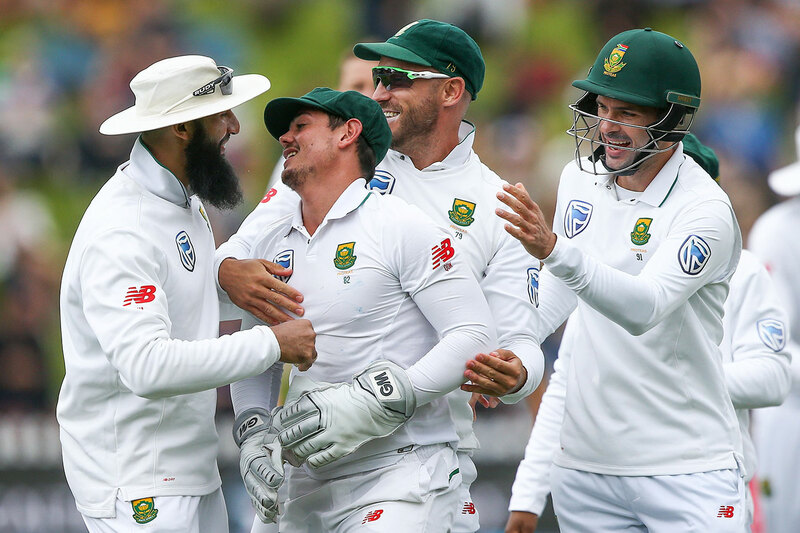 At the time of writing, bookmakers have the Proteas as fourth favourites behind obvious front runners England and India, and just behind perennial champions Australia. That seems generous given the absence of de Villiers, the struggles of the lower-middle order, a lack of understanding on how to play spin and a dearth of world-class death bowlers. If South Africa are to finally rid themselves of the "chokers" tag, they will need de Kock to fulfil his potential on the biggest stage. His quest begins at The Oval in the curtain-raiser against the hosts England, and a possible duel with fast bowler Liam Plunkett. Plunkett had an intimate view of de Kock's 98 in Southampton in 2017 and offers an interesting perspective from an opposing camp. "He picks up length at a ridiculous speed," says Plunkett. "He hits the ball so hard for a guy who isn't so big but he also has very delicate hands and plays that late-cut shot very well. He doesn't need much width to cut so as a bowler you want to hit the top of his middle stump. But if you get the length wrong he whips you over midwicket. He's got to be one of the most challenging guys to bowl to in international cricket." De Kock relishes the prospect of being seen as the main man. Just past his 26th birthday, he is maturing from a "naughty little kid", as he describes his younger self, into a leader capable of carrying the batting hopes of his side. He offers no guarantees. "There is more to life than just cricket," he says. He shuns social media and only reluctantly opened an Instagram account. "My wife encouraged me to open one so I could let people know I was out there. But I mostly follow pages about nature." Despite his ability to tap into a bottomless well of late cuts and pickups using a willow that seems to be made of nothing but sweet spots, he wants to be remembered as a great fisherman rather than the greatest in a succession of wicketkeeper-batsmen that include Gilchrist, Kumar Sangakkara and MS Dhoni. He can only promise to do things his own way. "Me and my mates were joking that after I was made captain I should have got neck tattoos and loads of piercings. I'm never going to be the head boy. I'm a little outside the box and I enjoy being a little different to people. I'm cool with that."